Supergirl was one of the weaker element in the New 52. Not in terms of powers, but in terms of how the character was handled. Towards the end of that time, Kara Zor-El lost her powers completely, and Supergirl Rebirth picks up from that point, as the DEO shoot her into the Sun to give her a recharge. It quickly becomes apparent that this new series is meant to harmonize, somewhat, with the tv series. Not completely, but close enough to make the comic feel familiar to viewers of the show. Supergirl’s overall appearance returns to her classic look, which is also her look on the show. The DEO are given a prominent position in the tale, and Supergirl works in conjunction with them. In a particularly nice touch, Cameron Chase gets to play a major supporting role in the series, as the head of the DEO. Rebirth also introduces Jeremiah and Eliza Danvers, two operatives of the DEO, who are given the assignment to act as parents for Supergirl’s new human identity. National City is made her home base, but Supergirl is high school age in the book. It’s a shame to lose Cat Grant, one of the best elements of the tv series, but a teenage Supergirl is usually the default for the comics, and Cameron Chase fills the vacuum left by Grant’s omission from the strip. Orlando does a commendable job with this debut issue, making Supergil a compassionate figure, but not a pushover. This is far more enjoyable than the untrusting and tempermental version from the New 52. Luppachino and McCarthy’s art is excellent throughout. Being an old-time DC fan, I also really enjoyed that this story brought back the Werewolf from Krypton, a one-shot villain who faced off against Superman and Batman in World’s Finest Comics back in the late 70s. Lar-On appeared in only one story, and his werewolf nature was never really explained, although it continued to be a plot element in a couple of stories that followed. In this telling, Lar-On gets infected while on Argo City by red kryptonite, and sent into the Phantom Zone by Zor-El. 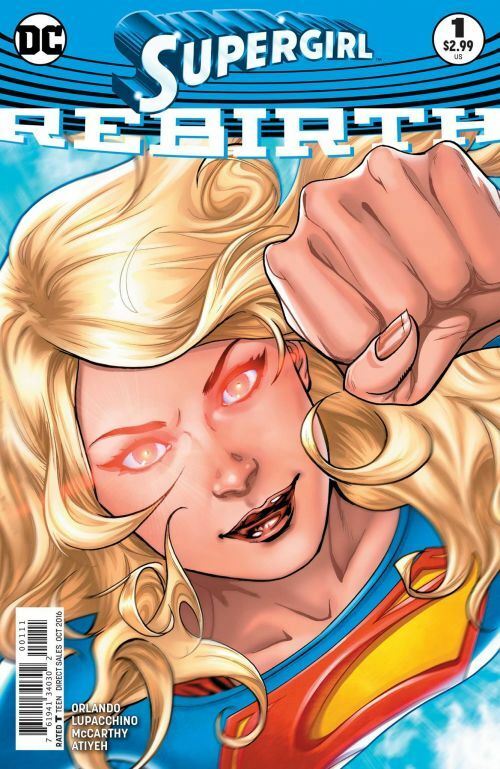 This occurs after Zor-El has sent his daughter off to Earth, and the comic teases further developments with Argo City and its inhabitants, which Supergirl is, for the moment, unaware of. All in all an excellent reboot, combining classic elements with some of the better touches from the TV series.